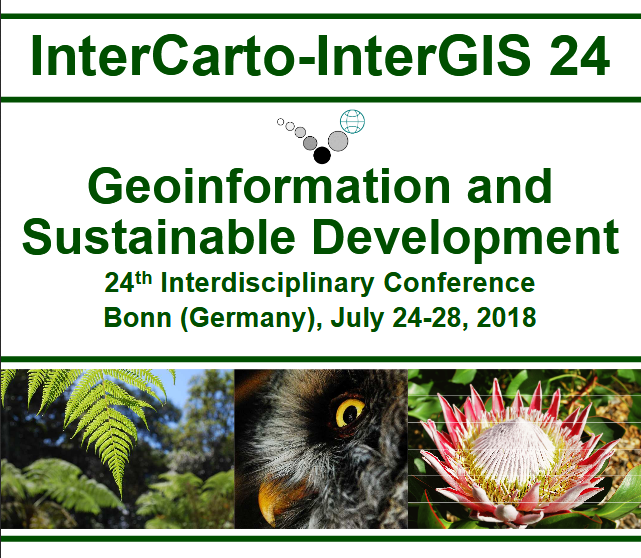 InterCarto-InterGIS 24 is the 2018 event in a conference series that is devoted to Geoinformation and Cartographic Support for Environmental, Economic and Social Aspects of Sustainable Development and Globalization Challenges. Topics discussed in this conference include Databases, Open Access, Big Data, Complexity Management, Standards, Interoperability, Information for Decision-Making, Ecological and Sustainable Tourism, Urban Ecology and Planning, Remote Sensing Information, Land Cover, Risk Information Management, Analysis and Mitigation. The Bonn 2018 conference especially focuses on Information Management for Nature Preservation, Biological Diversity, Landscape Protection, Risk and Resilience. Special interest is devoted to cross-program information coherence as well as synergy aspects on global and regional scale, i.e. the UN international programs (IPBES, SDGs, Agenda 2030, IPCC, ISDR, HABITAT etc.) as well as UN Development Group Strategic Plans (e.g. UN SP on Forests) and the relevant directives of the European Union and other bi-/multi-national treaties.